Author’s Note: This is a second article about credit cards that offer military discounts whether in waived fees, interest rates or both. The first article was detailing the benefits offered by American Express which included 0% and no waived fees (except USAA) If you know of any other credit card programs that offer a discount for military members and their family’s please leave a comment below. After hearing someone mention that Capital One also offers a military program I did some digging and found the following information from Capital One website. The Service members Civil Relief Act (SCRA) provides financial relief and protection to eligible military personnel serving on active duty. Capital One is committed to the spirit of the SCRA, including provision of benefits and protections above and beyond what is required under the SCRA in certain situations. Army, Navy, Air Force, Marine Corps or Coast Guard reservists serving on active duty. Commissioned officers of the National Oceanic and Atmospheric Administration and Public Health Service on active service. Credit cards and lines of credit. Mortgage and home equity loans. Other loans and lines of credit. Loans other than credit cards and lines of credit must have been opened before the active duty member’s start date. A maximum interest rate of 4% on accounts both owned and serviced by Capital One. No fees assessed on accounts, except bona-fide insurance. Within two billing cycles, you will receive a response from Capital One regarding the status of your request. 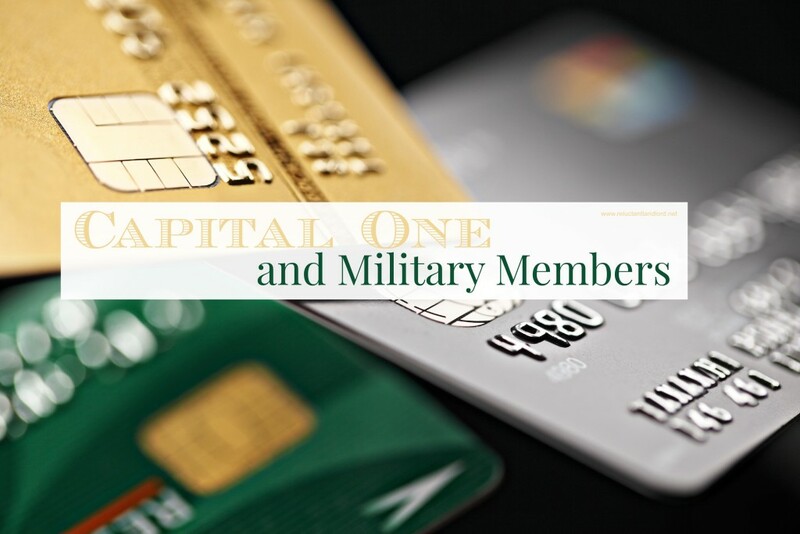 In addition to reviewing any military orders provided, Capital One will check the Defense Manpower Data Center (DMDC) website to determine eligibility. If they are unable to verify eligibility, they will send you a written request to obtain a copy of acceptable military documents. Unlike the American Express Program where I had to call and request the benefits, there is an online form that you can submit for the Capital One program. The link to the online form is found on this page in the form of a button called “request benefits” in the right column. Credit Cards can be a benefit (as demonstrated in my ability to earn free Loft clothes through ever day spending) as they are a liability. As with any tool it is important to know how to use it. As a frugal person with a very expense goal of a building my rental empire, I am on a quest to identify all the credit cards and bank deals that offer military discounts, whether they are all the time or simply during a deployment. Please leave a comment on ANY credit card or bank deals you know specific to the military or other specific demographic for me to do a feature on. We were very pleasantly surprised by the outcome of requesting an SCCRA review in our Capital One card. All I did was log into my husband’s account and send a secure message requesting SCCRA benefits on two cards he still maintains with them. Neither have a balance but they are our oldest credit so we keep them- the fees were adding up though. About a month later, they sent us a letter that they’d verified our eligibility and were lowering our rate to 4% and waiving annual fees. They also refunded us ALL past fees to my husbands date of entry into AD as well gave us a refund on the difference of interest. The surprise came when they did this on ALL of my current and past Capital One accounts. I didn’t request this at all. When I saw over $2,000 in credits (I was young – credit wise- and had a couple subprime cards for them in the beginning of our marriage)- I was worried it was a mistake and called. They assured me it wasn’t and I qualified as his spouse as well. The process was simple- I didn’t even have to furnish orders- they verified everything through the DOD themselves.. I was even able to request the credits be refunded in a check after the first billing cycle when they appeared. I only had to get on the phone when I verified what they’d done for my cards. Thank you for sharing! That is awesome.